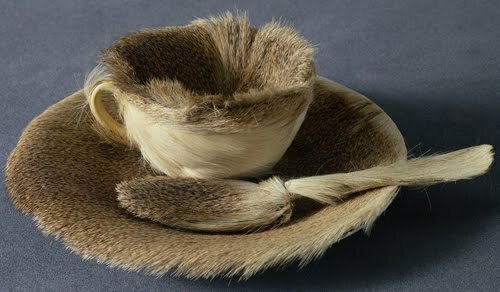 This piece is a fur covered cup, saucer, and spoon. It is a a surrealists work by Meret Oppenheim. She got this idea from a conversation with Pablo Picasso that almost anything in fur. Though I consider this a work of art, it creeps me out. When I look at it the thoughts I receive are ones of actually using the object as what it is naturally created for, tea/coffee. It is weird to think of putting that spoon or cup anywhere near my mouth it makes me feel like I would be holding an actual dead animal near my lips. Though his art is in the right place it is not on my agenda to purchase or have in my home in any sort of lifetime of mine.